We are counted among one of the leading manufacturers of a wide array of Simpolo Bio Pesticide. The offered products are manufactured using superior grade raw material, which we acquire from the reliable vendors of the market. These pesticides are widely used by farmers, planters, gardeners and the likes. Moreover, these products are safe to use and have no hazardous chemicals which can cause problems to the environment. We are the leading manufacturer of Bio-Pesticides and Bio-fertilizer. simple pesticides are Simpolo Bio Pesticide. This product is highly effective and control in any stage of crops. 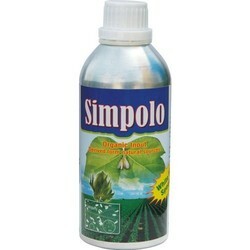 Simpolo Bio pesticides mainly used for cotton & vegetables. Mainly used for cotton, vegetables and other crops. Fatty Acid and salt of Alkaloids with the mix of wild plant oil.